Real handmade Ram's Horn handle knife with beautiful D2 Steel blade. Incredible hunting knife or collectors item, comes with sheath as shown. Unique one of a kind blade for no two can ever be the same! 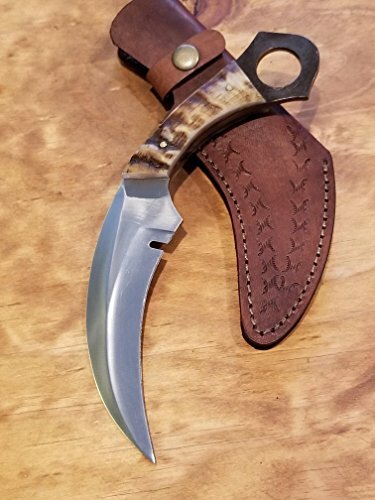 Amazing Premium Hunting Knife: • Real Ram Horn Handle • Real Leather Sheath • Beautiful Steel Blade • Handle Length About: 5" • Blade Length About: 5" • Overall Length About: 10" DISCLAIMER: WHEN YOU PURCHASE THIS KNIFE YOU ARE CONFIRMING US THAT YOUR AGE QUALIFIES FOR THIS PURCHASE AND THIS IS A LEGAL PURCHASE. Artisan Bound TAKES NO RESPONSIBILITY FOR ANY ILLEGAL PURCHASE OR USE OF PURCHASED ITEM(S). If you have any questions about this product by Artisan Bound, contact us by completing and submitting the form below. If you are looking for a specif part number, please include it with your message.